Become a Volunteer | South Carolina Carry Inc.
South Carolina Carry wants to defend and expand gun rights in the state of South Carolina, but we can't do it without you. Sign up to volunteer, and we'll work with you to make the most out of your efforts to protect the Second Amendment. 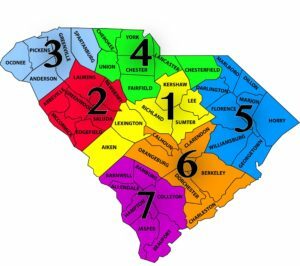 Once you have become a paid member of our organization we will assign you to your Zone and County leader depending on where you live. You can see which zone you are in on the map. Here are some practical ways you can volunteer your time and talent. Volunteer for one or two hours at one of your local gun shows in your zone. Pass out flyers and business cards to local gun shops and ranges in your area. Talk to 2A friendly businesses about being a corporate sponsor for our organization. Write blog posts about gun industry and 2A topics. Come up with creative ways to serve your community and draw positive attention to our organization. Call your friends, family members and co workers and recruit them to be members. Call your lawmakers and communicate with them about laws they should or should not support that affect our liberties in South Carolina. Team up with a board member on one of the committees and help with projects. Be a social media ambassador for our organization on the different social media portals. Help us put together a monthly newsletter. Help us to partner with other 2A friendly organizations to give us more exposure to the residents in our state. Pick the demographic you fit into and reach out to that group of people and encourage them to join us in the fight for our liberties. If you are a woman shooter, reach out to other women shooters. We all belong to some sort of group or club that we can identify with.